Your collection has to be much more static than mine to achieve "100% sorted" status. I usually hover between 50% and 85% sorted. I would guess that, if you have a set-sorted collection and a part-sorting scheme, you should be able to break down an individual set in a couple hours. I am new to fbtb.net but I am currently 100% sorted. Certain sets are sealed in the box and they are shelved. The loose kit that I get from garage sales and CL (or eBay if it is a deal) are sorted by color. I will later separate them further after I get past the 100,000 brick mark. I have been buying some of the bogo sets and I always try to buy out Target of their clearance items. My unopened sets are in boxes. My pieces are in a variety of tupperware/storage containers with minifig related accessories in one of those compartmentalized screw holder things. My preference is to sort by type of piece. I don't quite get the idea behind sorting by color. If I build something sure I might decide that it's mostly going to be gray or black but looking for individual pieces in a sea of monochrome is incredibly difficult. If I need a bley slope then I go to my slope pile and then let the bley slope stand out on it's own against the other colors. Is it that much easier for people to sort by color? 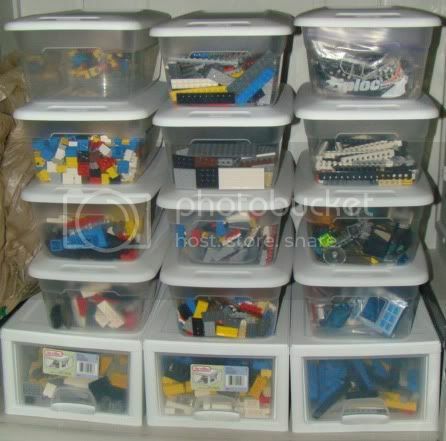 I sort my LEGO by using tackle boxes, those drawer bins you can find in the tool section and small ziplock bags you can find in the craft section at walmart. I purchase 2 totes, 40 lbs each 2 summers ago ... and I'm still sorting. that need to be identified. Thought I'd add to this discussion now that I sort of have my building area set up. A combination of Sterlite and Akro Mills storage units, with some LEGO cups for overflow. I labeled my drawers with the new labels 3M makes. and this is just a fraction of my stuff with alot of it stored in larger tubs and such when not in use. Even though I've only just started sorting lego bricks out and my collection of brick has only just crossed 1000, I think there is a point here that has not been crossed as yet. 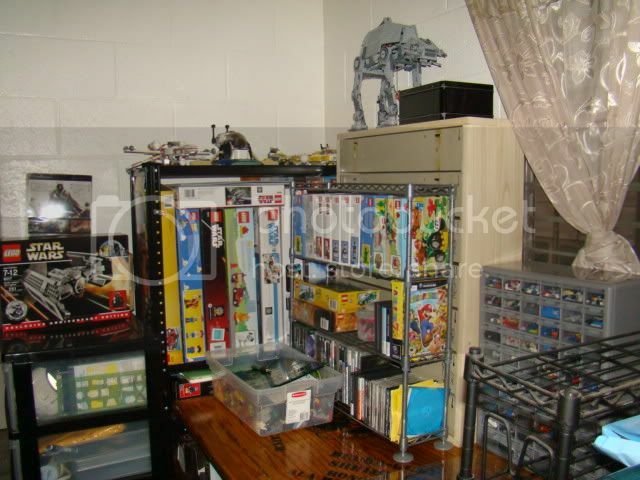 All of the storage systems on this post look awesome and when the collection gets to the size that you are speaking about, I dread the thought of having to change the way you sort things! 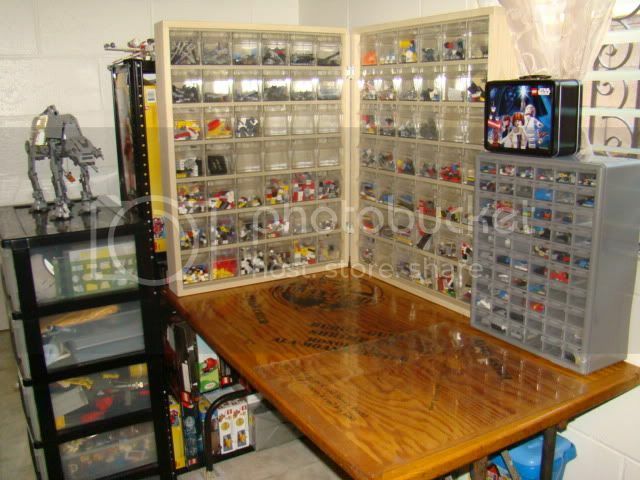 Having said that, I'm sure that the owners of these collections know exactly where every piece they own is and could probably walk into there crowded basements and walk directly to the storage bin that has the 1 x 1 button widget and pull out the exact color they need to fill an order. Me on the other hand am not so clever. 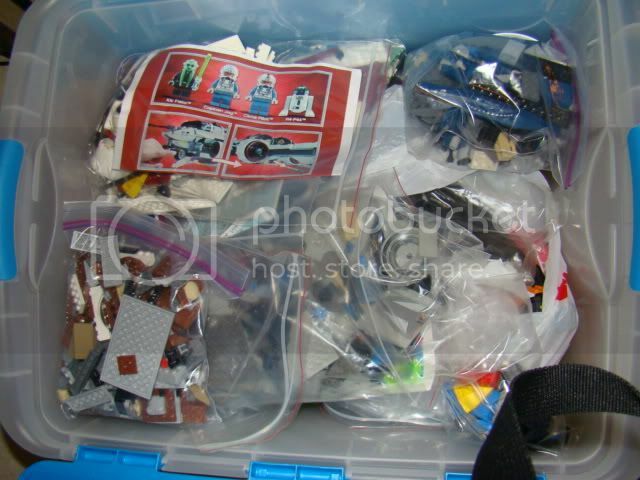 If you are thinking of starting up a store, or even looking to build sets for a collection of lego bricks the you were given by the grandparents of the friends next door, you need a method of being able to find the parts easily. Identifying the parts can be done usually by looking at the instruction books. They normally have the element ID list at the back of the book. But if you have a pile of bricks in front of you, this element ID is pretty much as useful as a bucket with not bottom. My theory is to sort the pieces out that will serve you best. If you are planning on opening a store, then you will need to sort your blocks out so that you can find the part that someone has ordered from you based on where you have raised the store. For example, bricklink has all of there parts listed down by the Lego Description ID, and then they list the colour in each page, Therefore, you should sort your parts by Part number and then by colour, or vice versa. If you are trying to put together sets, I would sort brick by Element ID so you get the exact part you need based on the part you need to build your set. The next step is to be able to find yoru parts easily. If you have a PC, and are a little Savvy, I would suggest a searchable database (MS Access or the like). If not so savvy, then a spreadsheet at the very least. In this you can add the element ID, Colour and the location of the part in your storage system. For example, You have some of those multi compartment drawers or conatiners, just number the conatiners (you can even number the compartments in the conatiners if your wish, but not really neccessary) and place that number agianst the element ID in your spreadsheet. This way, it doesnt matter if the parts are stored away from there like parts, you just do a search on your spreadsheet and find the part based on the element ID from the instruction book. AS you collection grows, just add more boxes. Personally, I have sorted my small collection out early, by Color and then by Design ID. I plan to start up a Bricklink store, so when I get an order, I can find the part first by color and then by Part number. I have used part envelopes in storage boxes so i can sort the part numbers as needed by color. If I need to change the way I store parts, it will not be a big issue for me to move the parts. I downloaded the brickstore software to build my database purely because It has a feature that allows me to bulk upload to the bricklink store. In this database I can add the location of the parts as my collection grows. 3. Simplify how you use your storage boxes so that you dont have to move parts, ie number your boxes and add the number to your inventories. PS Here is a quick Pic of how I have started my collect sort. No guarantees that it will not change, But, I'm able to still follow the principles above. I want to thank those who shared their experience in sorting Legos. I exclusively bought legos from 2nd hand market and got myself plenty of work to do. I organize from largest to smallest and by SHAPE. I started with color sorting but as earlier posts mentioned, it gets harder when looking for a piece on the same color. I have 6 of the AkroMills cabinet and I think they are great in fitting lego pieces, vertical going 6 (lego buttons) and horizontal max is 16(buttons). For the smaller 1x1 and circles I used the 24 storage bins ($3.99) from harbor freight, I find its curvey scoop helpful in getting the tiny pieces. I later on upgraded to the Store house 20 bin storage ($7.99 sale) that has independent bin as I find it useful to be able to move the smaller bins according to shape. So for weapons and miscellaneous items, I use the tiny 24 bin plastic, for technique pieces I use the Store house 20 bin storage as well as connector bricks. The rest I use the Akro Mills and to fill in the cabinet space, I used the Sterilite 5 bin storage for those that have larger quantities. Hope the image displays. dW's Edit: I changed these to links, since bbcode will not let you link to a non-image file... whatever you put in there has to end in gif, png, or jpg. Apparently Google Plus doesn't show you the actual image on a link. Oh wow, I'm no where near as organized as some of you peeps. I use a hand full of Sterilite drawers of all sizes and separate by styles. For example bin#1 black, grey, dark grey 1x1 to 1x12's and 2x2 to 2x3's, bin#2 2x4 to 2x12, bin#3 is plates 4x4 and up, then all my colors like red or tan and so on have there own larger bins with baggies separating smaller or special parts. But hey it makes it fun hunting down the parts you need for a project and also faster for re-sorting after the tear down of a set! iamFLIP wrote: I found a local hardware store that is renovating and bought a few of their old system they used to store/display screws, bolts, nuts, etc. Each one has 6 compartments that flips open. I made 2 wooden frames with hinges so I can close it like a briefcase when I don't need it so my little boy can't mess it up. It looks kinda empty on the picture but actually most compartments are now full after I was done sorting out everything last night. Also, bought StackOn 60-drawer cabinet for smaller pieces. The two lower drawers of the black Sterilite on the left holds the larger pieces. And the Lego Star Wars lunchbox holds the SW minifigs (for now). 6-quart Sterilite containers holds the medium-sized pieces. and a 20-gallon storage bin holds the sets I am trying to piece together. And when the wooden frames/"briefcase" is closed. It also acts as display stand. That was actually pretty impressive.